The Skinny: As corny as modern movies get, and also as agreeable. The Capraesque values are actually quite winning, and Takuya Kimura and company carry the film with affable humor. More for fans than casual viewers, but even the uninitiated may enjoy Hero. Didn't see the TV drama? That's okay, because even though you may not get everything that goes on in Takuya Kimura's small-to-big-screen drama Hero, there's still some enjoyment to be had. 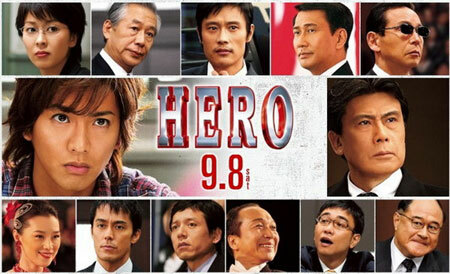 A sequel to the blockbuster 2001 Japanese TV drama and 2006 TV special, Hero is a slam dunk for rabid fans, though the uninitiated may not respond to all the quirky characters or oblique references to past events. However, the film's do-gooder protagonist and charming Capraesque values go a long way towards creating universal appeal. Hero marks the return of public prosecutor Kuryu Kohei (Kimura), a righteous, determined young D.A. who breaks all the rules for all the right reasons. Assigned to prosecute an open-and-shut manslaughter case, Kuryu goes into full-on righteous Hero mode when the defendant changes his plea from guilty to innocent, causing a minor uproar in Kuryu's offices. The defendant, a dyed-blond security guard, originally pleaded guilty in a sheepish manner, but he's now ready to go to court with the backing of a pricey defense lawyer named Gamo (Koshiro Matsumoto). It seems the defendant is being used as an alibi in a bribery case; a powerful, corrupt politician (Kazuyoshi Morita) has been accused of taking a payoff, and the defendant supposedly saw him in another place at another time. Of course, that's totally untrue. All the players are guilty as sin, but big people with big money don't want their corruption exposed, so they'll get the high-priced Gamo to defend a lowly nobody, the idea being that an unjust victory will keep their pockets full and the evil corruption machine greased. However, they didn't count on Kuryu, whose righteousness and determination know no equal, though at first glance you probably wouldn't expect that from him. Even though he's a public servant, Kuryu dresses in sloppy jeans and sweatshirts, has an over-coiffed mane of dyed orange-brown hair, is sometimes inattentive and spacey, and never wears ties in the courtroom. When it comes to work, however, he's all business - only more so than your standard lawyer types are used to. Other prosecutors would give up and call it a day after a cursory look at the evidence. But not Kuryu Kohei, who won't give up when trying to do the right thing, pursuing leads to the ends of the Earth (or, in this case, Korea), searching haystacks for needles, and generally going the extra step, kilometer and/or light year required to find that most elusive of things: the truth. Will he find the truth behind the crime and uncover the true culprit before they get off scot-free? Whoops, that sounds like a mystery, which Hero most definitely is not. There's no question here about who's bad or good, and the trail towards the truth is more about extreme legwork and connecting the dots than it is about deduction or true investigation. Hero is a "hard work pays off" movie where the issue is not how to solve the crime, but merely how to do things the right way. To wit, everyone knows who did what and the prosecutors just need evidence, even if it means combing the city inch by inch and sweating every last detail or lead, no matter how minor or infinitesimal the chance is that they'll find something. The lengths that Kuryu and his colleagues go to strains any realism because a normal person would definitely give up if they had to check every mobile phone in a neighborhood just on the off chance that someone took some incriminating photos. Hero supposes that these people will hike one hundred extra miles to secure the truth, and does it in such an earnest fashion that the audience can either applaud at the wholesome decency on display or gag at the saccharine silliness of it all. As an audience member with some personal taste, this is where you make your choice. Time to get on or off the bandwagon. Well, we're going to get on the bandwagon, because the righteous, good guy world of Hero is pretty damn charming. It's the very thing that made the TV series so likable, and indeed, audiences in Japan have apparently lapped up Hero to the tune of mucho box office. The appeal of the world is not hard to understand, as Takuya Kimura is one charismatic dude, and he makes Kuryu Kohei an immediately likable figure. As detailed in the TV series, Kuryu was previously a juvenile delinquent before becoming the most gee-whiz D.A. in Japan, and his earnest rebel-with-a-cause ways make him a refreshing screen hero. When challenged by Gamo's wily tactics, Kuryu responds by actually being grateful for the challenge, and pledges to handle things fair, square, and without any undue grandstanding. Kuryu is not after the splashy headlines or the juicy cases, but desires simply to honor whoever it is he's supposed to be serving, like a grieving widow or just some disenfranchised individual. It's like he's...a movie character! Which he obviously is, but he's a very winning one. Capraesque characters and working class heroes are always easy to root for, so director Masayuki Suzuki can get away with blatantly unrealistic situations and cheesy platitudes that would normally annoy cynical audiences. That's a good thing, because there's plenty here for the cynical to chew on, including too many characters who try to do the right thing, a defense lawyer who's so awed by his earnest prosecutor rival that he'll even screw his own client, and big rousing speeches that sound like they were pulled out of a can labeled "Inspirational Screenwriting 101". Hero slops on the cheese, but does it in agreeable, low-key style. The filmmakers don't use a hammer to force their issues; it's like they're getting down on one knee to offer their cheese on a polished, presentable platter that's not egregious or tacky. It's obvious but functional, and so is this movie.